This garniture, or set, of five vases originally was made for display on a mantle. The vases show various patterns, including one scene depicting the Chinese imperial couple seated and drinking tea. Overhead are a flying dragon and flying phoenix, symbols of the emperor and empress of China. This set was made for Augustus the Strong, Elector of Saxony and King of Poland (reg. 1694 – 1733), who founded the Meissen Manufactory in 1710. Meissen was the first European firm to unlock the secrets of porcelain manufacture, which had been made in China since the 7th century. The Ralph H. and Constance I. Wark Collection of early Meissen porcelain is one of the three finest and most comprehensive collections in the world. Ralph Wark (1901 – 1987) bought his first Meissen piece in 1922, and over the next 60 years acquired more than 700 pieces. Before World War II, Mr. Wark was a representative of the National Cash Register Corporation in Europe and traveled extensively on the Continent. At various times, he lived in Hamburg, Paris, London, and Berlin. Ralph Wark and his sister Constance, residents of St. Augustine, donated this unique collection to the Cummer in 1965. 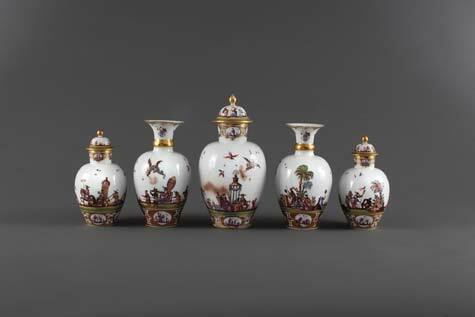 Visit meissen.cummer.org to explore the Meissen Gallery.